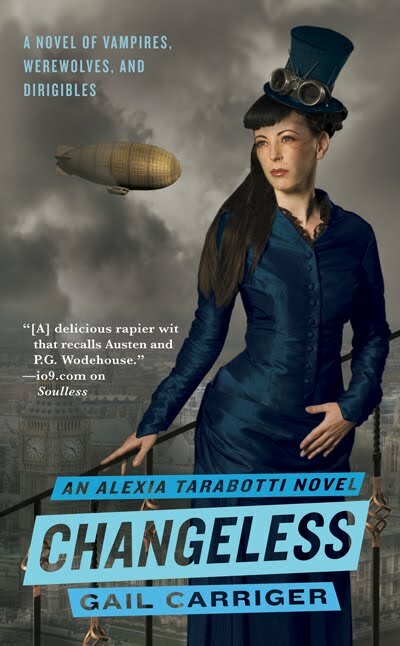 Having enjoyed Soulless despite some tedious and spotty world-building, I was really excited to read Changeless. I love Alexia for her pragmatism and levelheadedness and was looking forward to her next adventure. I was also excited to read about she and Conall as a married couple. Neither of them are very "lovey-dovey" but they do have a sweet relationship and usually treat each other with love and respect. I say usually, because at the end of the book Conall behaves quite unlike himself and I really hated him for the way he treated Alexia. One of my favorite things about this series are the secondary characters. They are so well written and full of, well, character. Madame Lefoux and Lord Akeldama are my favorites, although Ivy and Tunstell are close seconds. Alexia's family is also well-developed and I enjoy her interactions with them. One major warning is the cliffhanger at the end of Changeless. I would recommend having Blameless (book three) on hand before starting Changeless. Believe me, you're going to want to jump right into it after the events of Changeless. Overall, I think that this is a great series, especially for fans of historical fiction, steampunk, or fantasy. Great review. I tried the first one of these but didn't love it. I have these on my nook waiting to be read..I really have to get to them. This novel had me laughing out loud. Alexia, like everyone else at that time, is obsessed with manners and proper etiquette. To her, the end of the world would occur when it ran out of tea. However, she does realize the absurdity of her family and how they judge others. Alexia's family reminded me so much of the Bennet family in Pride and Prejudice. There were also some similarities between Alexia and Elizabeth, not tons, but definitely some. You are so right! They remind me of the Bennett family too. Especially the mother, whose main concern is getting her daughters married off!